The Three corner Sat payload was to fly as a secondary payload on the NASA Space Shuttle Orbiter together with the three ION-F (USUSat, Dawgstar, HokieSat) satellites, but has been changed to a piggy back launch on the maiden flight of the Delta-4H rocket. The mission is made up of three primary and three secondary mission objectivese. end-to-end command and data handling. The science included stereoscopic imaging of clouds and other atmospheric structures using a satellite formation. This was to be accomplished while using virtual formation communications, a technology that allows satellites to operate as a network utilizing communication and data links. Finally, the formation was to use distributed and automated operations in the innovative and data handling system. This allows both the individual S/C and the formation to reconfigure themselves for optimum data gathering, command/control, communication. The secondary missions include demonstrating micropropulsion, demonstrating a generic S/C bus design, and emphasizing student education. The micropropulsion experiment was to be used to increase the altitude of all three satellites allowing an extended mission lifetime and greater data gathering capacity. This system, developed at AFRL/Edwards AFB, ASU, and JPL was to be an important pioneer for future small S/C propulsion. The S/C bus is a modular. Easily configurable design, allowing one to fly multiple science payloads with minimal modifications to the structure and configuration. This program additionally emphasized student education as students actively participated in program management, design, manufacturing, testing, and operational aspects. Sparky and Ralphie were to be dropped off at a low 180 × 240 km orbit and were due to reenter in 2-3 days. 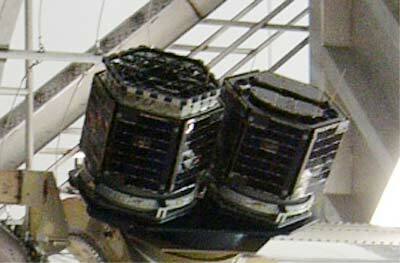 The third satellite, Petey, was not launched. Owing to an under-performance of the Delta-4H launch vehicle, the nanosats entered an orbit at a height of only 105 km, which lead to a rapid decay and to the loss of the mission. The third satellite Petey, built by New Mexico State, was donated to the National Air and Space Museum’s Steven F. Udvar-Hazy Center.